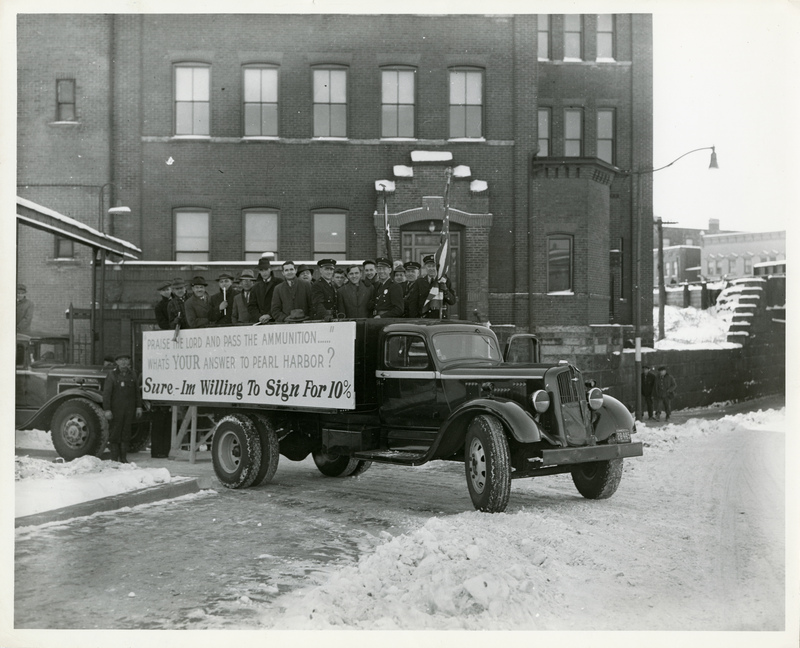 An employee bond drive organized by the American Brass Company. 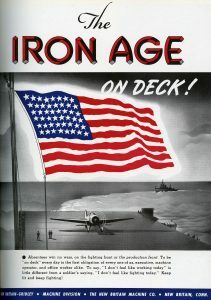 Unlike many nations around the world, the United States escaped the widespread destruction brought on by World War II. While thousands of U.S. soldiers fought abroad, many civilians stayed safely at home. But the lack of fighting on the home front did not mean the absence of war. Daily life in the United States became subsumed under the goal of supporting its allies and defeating its enemies. The reality of total war lead to dramatic changes to the country’s economy, society, and culture. 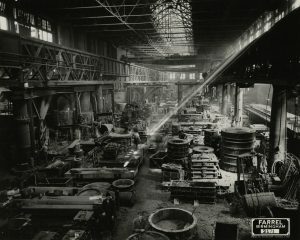 Farrel-Birmingham Company’s foundry during wartime. Long a vibrant part of New England industry, Connecticut played a crucial role in materially supporting the war effort. After the Japanese attack on Pearl Harbor on December 7, 1941, local businesses switched from making clocks and wool coats to mass producing artillery cartridges and Army pea-coats, as well as airplane engine parts, parachutes, and a myriad of other items to support the war. 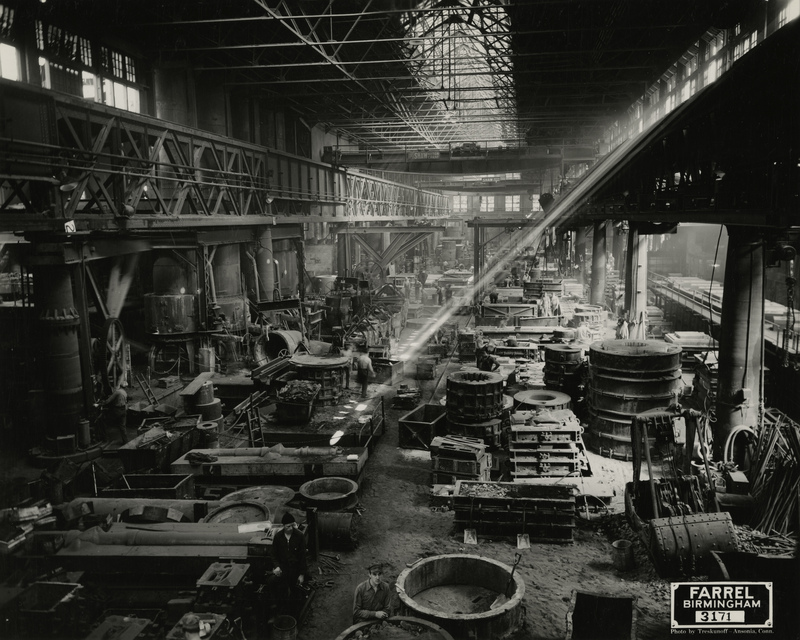 Industrial firms like the E. Ingraham Company, American Brass, and the New Britain Machine Company retooled their businesses to produce for the armed forces. Similarly, utility companies like the Hartford Electric Light Company and the Southern New England Telephone Company redirected their services to support wartime industry. The changes underway at many local firms reveal the trials and triumphs experienced by ordinary Americans serving their country on the home front. 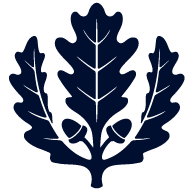 A shifting labor landscape also highlights the demands imposed on Connecticut businesses by U.S. participation in the war. As millions of Americans left their civilian jobs to serve in the military, local firms faced acute labor shortages at a time of increasing demand. To fill positions and meet new production goals, employers searched for new sources of labor, grudgingly accepted increased unionization, and relied on greater government support. 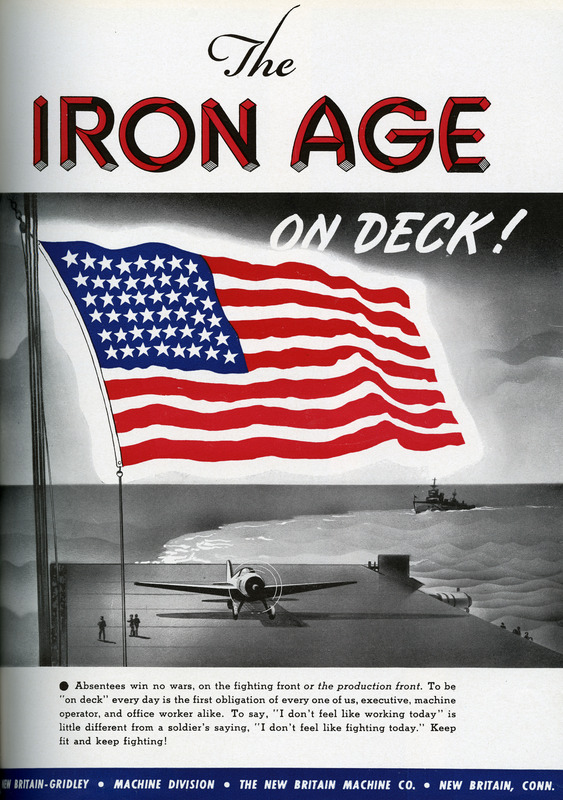 The cover from the New Britain Machine Company’s Enbee Chips magazine making the link between wartime production and the larger war effort. The look of Connecticut’s labor force seemed to change overnight. Women entered the industrial workforce in large numbers, an executive order against racial discrimination in wartime industry increased African-American employment, and the Bracero program brought Mexican workers into the United States on government-sponsored labor contracts. 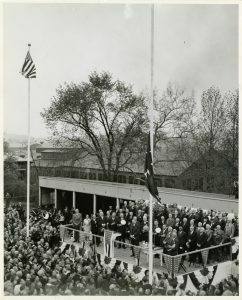 Ceremony honoring the American Brass Company for winning a production award during World War II. Prejudice and discrimination did not disappear. But the pressure to boost manufacturing output forced local businesses to adjust to a new economic reality. Connecticut businesses also supported the war in less material ways. Local firms used the workplace as a key site to help sell the war to the American people. Employers promoted American patriotism by urging workers to buy war bonds, grow victory gardens, and ration scarce resources. Businesses also partnered with the government to boost worker morale. They held stately ceremonies to recognize workers’ ability to meet the military’s high demand. And they sought to lighten long hours and strenuous production schedules with company-sponsored slogans, contests, and recreation. These efforts could even take on an ominous tone. Employers sometimes warned workers against “fifth columnists” who sought to undermine industries vital to the war effort. Whether at work or at home, the war was ever present. It did not stay overseas but reached deep into daily life, putting the most routine acts of production, consumption, and recreation at the service of Allied victory. Selections from the Connecticut business collections held by the University of Connecticut’s Archives & Special Collections paint a detailed portrait of this remarkable moment in history through the lives of the people who lived it.